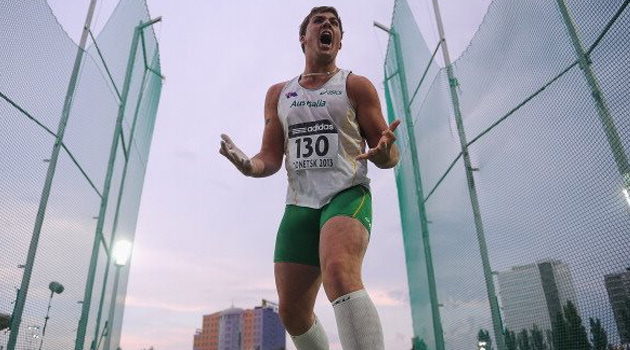 Matthew Denny is our 28th Athlete to speak to us about making the 2014 IAAF World Junior Championships Team. Members of the Spark Team will compete in Eugene (USA), from July 22nd to 27th 2014. I got into athletics when I was a little kid around grade 3. I never did ill athletics but because I was a big kid the teachers said “here you go, throw this” so I did, and I won… Even though it was a bean bag for shotput. Pretty much went from there. I was so happy, I finally made the junior side and I was existed to see the difference between youths and juniors, especially because I wasn’t allowed to go to 2012 world juniors. To compete, I have been waiting for this moment for to long especially after youths. I thrive for strong competition and a challenge cause I know it always makes me better and bring the best out of me. And I can also finally get redemption with hammer from competing badly at world youth and this time I’m going to try and get it all right. In the sport I haven’t really had any major inspirations, if I had to say one it would be Dani Samuels. Other then a crazy thrower, she is extremely humble and has showed me a lot of things as a young up and coming athlete into opens and bigger competitions. It might sound simple but it’s always works with no doubt. Work as hard as you can, do not listen to negativity and always surround yourself with a strong group of people and coaches that work with you and have nothing but positivity to put into your dreams and goals.